My TRX system...My mom got it for me and I put it up in my garage. Have you heard of it? My mom, dad, uncle and who knows who else are REALLY into it. It was created by the Navy SEALS who needed to be able to get a really good workout anywhere. It is these straps with handles on the ends. God knows what my neighbors think when they see it hanging down in my garage but whatevs. :) This photo was taken with my new speedlight. I took photos with the speedlight coming from many different directions to see the effects. 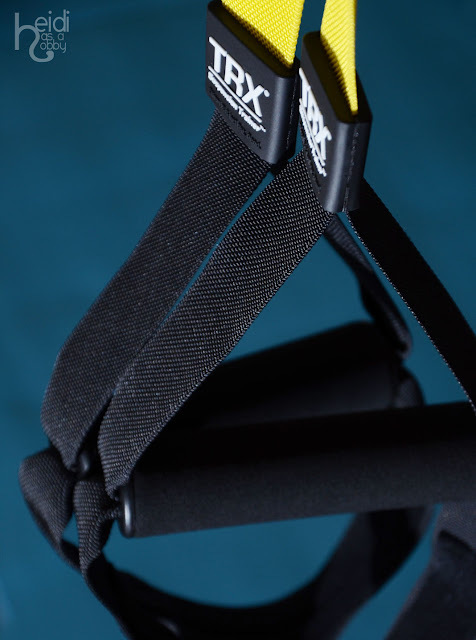 Scope out the TRX-I did the workout tonight and it is a burner-and I am starting with the easiest possible options. I love the IDEA of making resolutions. I want to(and have in the past) list out a gazillion things that I will do starting right now that will make my life immeasurably better. What a great feeling of order to have everything on paper and organized neatly, etc... Many of us, myself included, set lofty goals and end up feeling defeated when the reality is that we set something that was unrealistic. I must set goals based on how my life usually is-super busy with a ton on my plate and a constant fight of feeling overwhelmed. #2 Get up 30 min. earlier each morning to focus my day through an intensive and structured daily journal writing exercise Take a few minutes each morning to do what it takes to focus my day and center myself. It could be writing stuff down in a journal or it could be just looking at my day planner while I am drinking my coffee and thinking about what is most important that day. #3 Get up an hour earlier each morning-30 min. cardio and 30 min. stretching and resistance training. Chart and graph all exercises and record progress while I am at it. Get my TRX routine established and do it 2+ x a week...walk frequently with doggie and/or do WiiFit with smallfry who is totally into that right now! #4 Plan my food the day before and stick to it. Make half of every plate veggies and fruits. Drink 64 oz of water daily and take my multivitamin. Take my multivitamin, eat mostly healthy stuff only when hungry and drink more water. #5 Make sure that all of my guidelines are followed to a T. Let go of guilt! Someone else just posted about how she hates cooking and her resolution is to make the easy foods (pre prepared/frozen) and not worry about "cooking" so much. I feel guilt whenever I feed my daughter fishsticks or nuggets, etc... but it is such a timesaver and is fine to do once in awhile (once a week or so??). That is just an example...I am a mom and teacher and lots of other things that really have "unending job descriptions". I must do what I can and then not feel badly about doing the things that are most important and letting some of the other stuff go. Sounds like you are off to a good start! Great photo of the TRX! Keep us updated! getting up earlier, drinking more water, taking my multivitamins... I have written down these goals so many times, and they seem so simple, so why can I NEVER stick to them?!?!? I think I'll just have to go with the last one and let go of the guilt! wonderful resolutions! I have seen these in the local gym, good luck with it all! Yes!!! Great goals. I already get up a hour earlier than I need to so I can have coffee with my hubs each morning. I suppose I need to add another 30 min to that so I can get in some cardio too. good resolutions I hope you'll take time to realise ... and a good photo too ! Cool pic. I love your resolution, one step at a time is all one can do! I REALLY enjoyed your post. I like how you changed the lofty goals to do-able goals. I'm going to try that!